The founding member of Faith Force, stands 5' 10" and weighs 285 lbs. 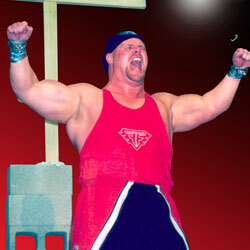 A competitive bodybuilder from an early age, Jeff won many competitions including Teenage Mr. North Carolina. Though he was expected to go on to even higher levels in the sport, God spoke to Jeff's heart and changed his plans, and freed him of his addiction to steroids. Jeff has been able to compete on the national level as a natural bodybuilder. Jeff has also studied various forms of martial arts, and uses his abilities to kick through huge walls of concrete set on fire. He lifts 300 lb. logs over his head and breaks through not just one but TWO pairs of police handcuffs. Jeff and his wife Rhonda live in Burlington, NC. Jeff is committed to give God all the Glory for all of his strengths and talents. Not only is he an incredible athlete, but also an accomplished artist as well. Jeff has designed logos and uniforms worn in four consecutive NBA All-Star games. He uses his talent to design and illustrate for churches and businesses all over the country. Jeff feels, "By making ourselves available to the 'Master Artist', we can accomplish anything, through Him. It's not about trying to show how powerful we are, but about how powerful He is."